About eight days ago, I made the decision to quit chewing tobacco. I’ve made the decision before – but this time I know I’m serious. I’m quit. I’m done. I know that I cannot go back. For me, there’s always been issues with my ‘quit’. So they weren’t actually quits. They were just stops for a little bit. Then I went back into the most addictive habit I’ve ever formed in my life; one that I picked up because of a little boy’s love for the game of baseball. 1) I can get through work with some kind of substitute. But I write about baseball online. This is an absolute time where I need to dial in my focus, and I need my fix. 2) All replacement chew out there has failed me. I am not here to name companies and slander them. They all try hard, and they help other people. They just don’t help me. The biggest problem is the ‘pack’ that all dippers love. You know what I mean – the hold in your lip. It’s not about the buzz when you’ve done this as long as I have. It’s about that feel. Both of my problems are solved by Cowboy Coffee. Discovery of this product has eased a lot of future stress. If I ever have that burning need for a dip or a little buzz, or that texture that has had me chewing since my playing days; I’ll grab a pinch of Cowboy Coffee. My testimonial is an honest one. I am an addict. I’ve had trouble stopping. I’ve tried atomic fireballs, mint toothpicks. replacement dips, cold turkey, everything in between. What I love about Cowboy Coffee is that it is first off; delicious. It’s a blend of coffee beans, honey, sugar, and cream and when you grab a pinch; you can put it in your lip just like a real dip of Copenhagen, Kodiak, or Grizzly Wintergreen. It will provide that texture you are used to, and you’ll get a little buzz from the caffeine. It helps bring about the same euphoria that I was used to with deadly nicotine products; yet it’s safe and all natural. I don’t have to worry about a work trip to Los Angeles to cover the Dodgers in August and how I’ll remain quit from this addiction. I will line my suitcase with a can of Cowboy Coffee per day, and be ready to go. I loved chewing. You won’t find a guy who ever loved it more. From the first time I put one in when I was playing left field (seeds made my mouth too dry) to the 35 year old dad I am today, I have a romance with the stuff. Believe me, if I can quit with this product; anyone can. I listened to this video of Stone Cold Steve Austin, and I realized at my age, it’s time to stop. Coming across Cowboy Coffee (and Major League Dip) has been a blessing in my life. As a guy who has tried everything under the sun to stay quit – I can honestly say I’ve come to the end of the road – and the final stop had the gold waiting for me. 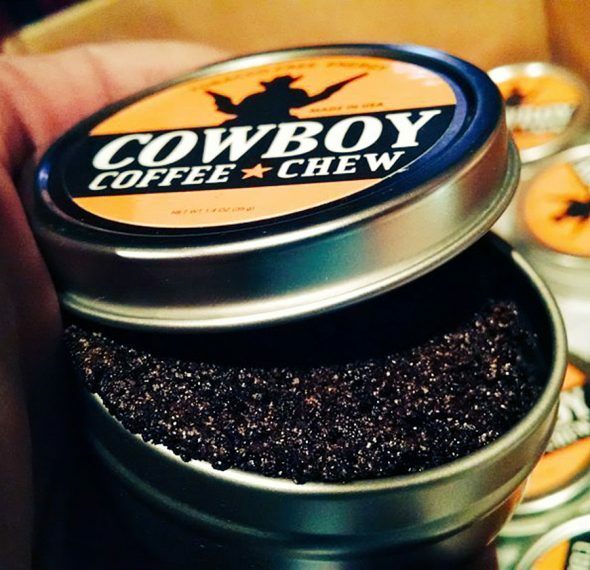 Thank you Chew Coffee Dip. You may have saved my life. And I’ll hopefully be around to make sure my two year old son never touches the stuff when he’s playing. God Bless, and I ask you to try to quit with me.